Hi folks. Just a quick note to say how much I enjoy tying with Daiichi hooks. Most of my experience with them has been on Alec Jackson Spey hooks, but I`ve also been given a few trout hooks to try as well. I tie a quite a few exibition patterns, most of which are donated for fundraisers for conservation organizations. 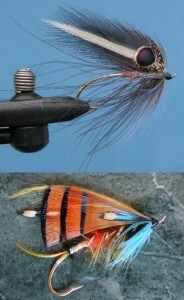 The picture I`m attaching is one of my original patterns, the Tiger Eye Spey, tied on a 1.5 AJ spey hook. The body is Siberian Tiger underfur, from a friends’ tigers’ grooming. The original was sent to my good friend who supplied the tiger fur, Keith Dyer, in British Colombia. Hope you like the fly. Oh yeah, I`ll attach the Durham Ranger on a 3/0 I did too. Trout Unlimited Canada, Nova Scotia. ‹ Pike Dances a Daiichi Jig!